Shaped cakes can surprise not only for its taste, but also the original appearance. 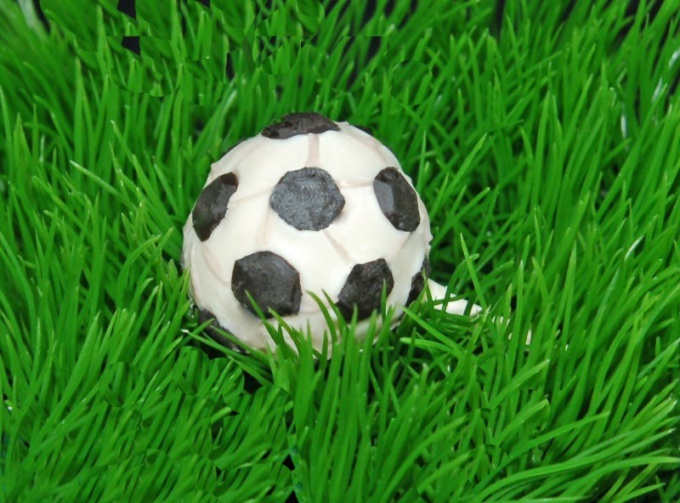 Your husband or son may like the original cake in the form of a soccer ball and can be enjoyed in the bakery or if you have some culinary skills to cook itself. - 100 g marzipan mass of black and white. A similar cake can be made of biscuit dough. First you need to make the base for the cake in the form of a cake. In a bowl break the eggs, stir in the sugar and put the yogurt. Mix well, then stir in the yeast and flour, pour vegetable oil. mix all components until smooth dough. Let the dough stand for an hour. After that grease a baking pan, pour into it the dough and cook the cake in the oven for half an hour. Ready cake cool. Nuts peel and chop. Add them to the cake with chocolate paste. Grind all together to make a single mass. Round bowl, cover with clingfilm and place in it the prepared mixture to form the hemisphere - the basis for future goals. put the cake in the fridge for an hour. Meanwhile, take care of decorations. Black and white roll out marzipan and cut into a symmetrical pentagons. From the strip of green marzipan cut grass. Ready cake remove from the refrigerator and cover with the marzipan circles in a checkerboard pattern. At the bottom of the cake attach the grass from the green marzipan. Serve dessert with tea at the coffee. - 1/4 tsp of agar-agar. Start with baking the external basis for the cake. In a bowl break the eggs, add 100 g of sugar and RUB white. Then add the flour and stir until smooth. Divide the dough into 2 parts, adding in the second cocoa. The dough roll out a thin layer and bake in preheated oven for 7 minutes. Cool the cakes. Prepare 2 stencil - hexagon and a Pentagon with symmetrical sides. Cut out stencil of a Pentagon a slice of cake, and hexagon - and a few black and white pieces. Take a round bowl about 15 cm in diameter. Cover it with cling film. At the bottom of the bowl in the center put the Pentagon and the Supplement it on the sides of hexagons of different colors in accordance with colors of a soccer ball. If desired in the dough, you can add cocoa, and chocolate. To prepare the chocolate mousse whip the cream with a mixer into a thick foam, adding 100 g of sugar and vanilla. Melt the chocolate, separate the dark and white. A quarter of the cream mix with white, others with dark chocolate. A bowl of already stacked on the bottom layers complete the layer of dark mousse and then a layer of light. Remove the cake to chill for an hour. The remaining sugar dissolved in half Cup warm water and simmer for 5 minutes. Then to the same place agar-agar. Cake remove from the refrigerator, gently remove from the bowl and remove the tape. Cover it with syrup, agar-agar, wait until the syrup hardens, and serve.